They’re back! It’s time for the first activity of the autumn/winter. 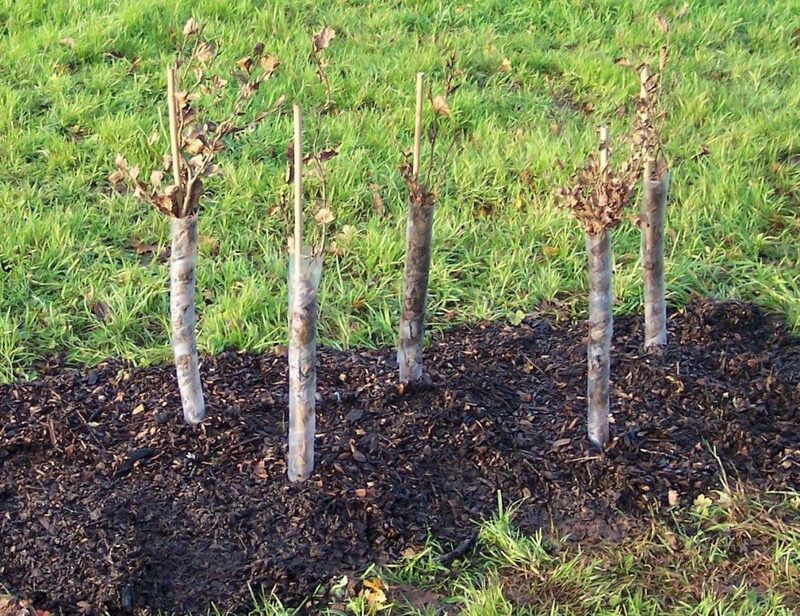 The first task of the season will be to revisit to the young woodland planted in memory of Gerard Le Claire, former Director of the States of Jersey’s Environmental Services Unit, who was tragically killed in 2001 whilst working for the United Nations. We last visited 2½ years ago to remove old tree shelters and do some woodland management, we now need to go back to do some more bracken management, gorse coppicing and tree pruning. There will also be some small scale felling required in order to ensure that the best trees are not crowded out and can develop fully. Time We will set off at 10.30 promptly to allow time to walk to the site so please arrive a little earlier. We will be finished by 13.00. The site Les Crete Quarry car park, St Martin. Head north along the coast road from Anne Port and park in the quarry on the left before you get as far as Archirondel (opposite the picnic area). From there it is a 10 minute walk up a very steep hill to the work site. There is very limited field parking onsite for a few cars, please let us know if you need access to this. Parking There is very limited field parking onsite for a few cars, please let Julia know if you need access to this. 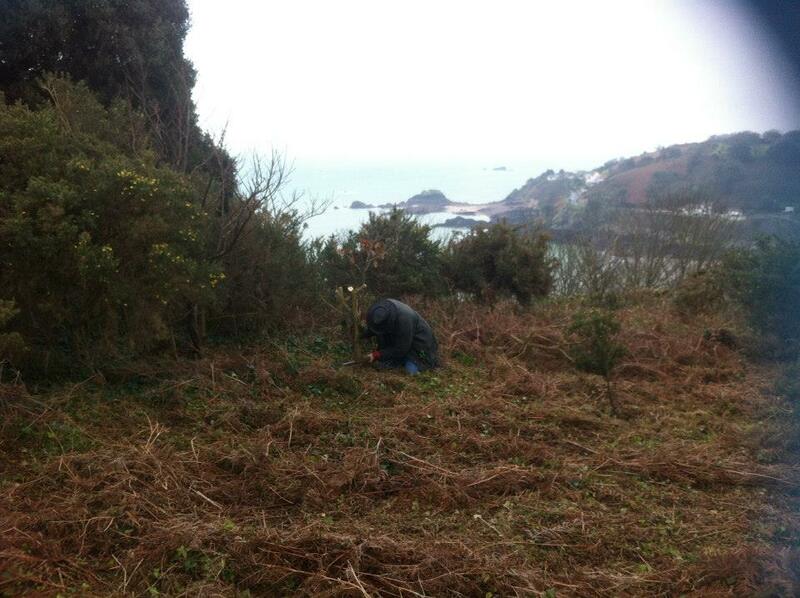 The task Bracken management, gorse coppicing and tree pruning. Tools needed As always, we can supply some tools, but please bring your own if you have them. Cutting tools such as secateurs and pruning saws will be particularly useful. Clothing needed Good thick gloves (though we can supply a pair if you don’t have them), wellies or sturdy boots, (it shouldn’t be muddy but the vegetation may well be wet it and it may be rough underfoot) and common sense clothes to cope with the element, we go ahead whatever the weather! The six imported birds from Paradise Park, together with Durrell’s four foster chicks, begrudgingly completed their quarantine period this month. The foster chicks took an instant dislike to the latex gloves and quarantine footwear staff had to adorn which resulted in abject horror any time staff came near. After a week of meet and greet between the half-inch mesh divide we mixed the Durrell four with the ‘newbies’. It was all very amicable and a lot of relief expressed amongst the newbies who took the opportunity to stretch their wings in the poly-tunnel. Having spent a week under cover they could also bathe in sunlight/shower in the rain/blow-dry in the crosswinds. Their frustration at being locked in the aviary was still apparent each time the free-living group returned to the aviary. 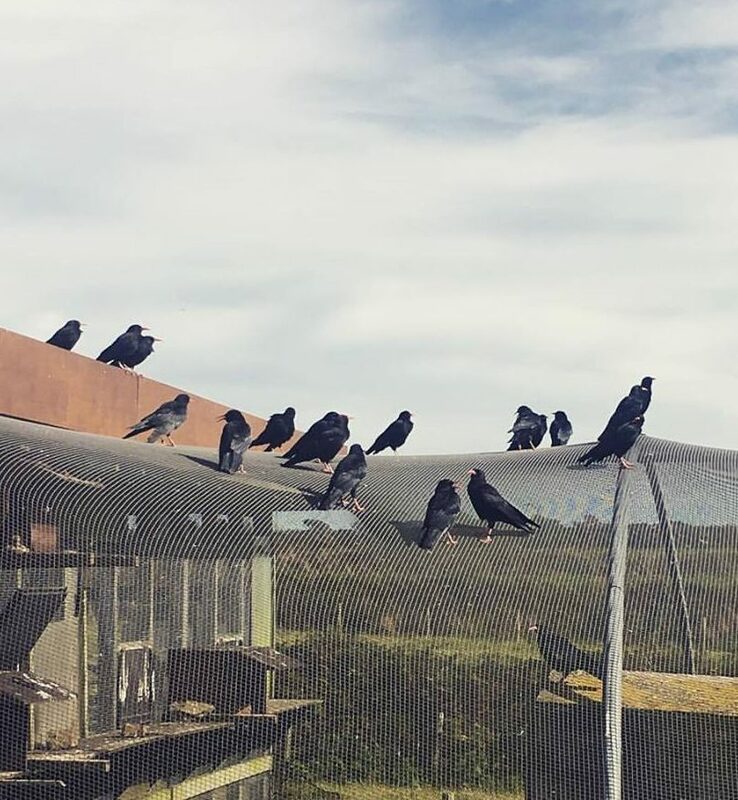 The quarantine group in the aviary paid a lot of attention to the free-living choughs. Often because they had no choice in the matter. Photo by Bea Detnon. 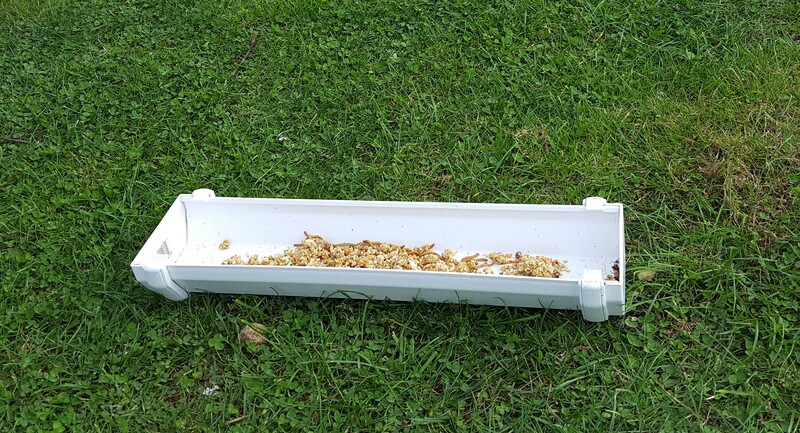 Weekly faecal screening showed that both groups had various levels of nematodes present in their faeces. Quarantine conditions were not going to eliminate Syngamus (gapeworm) from the group. They arrived with it and the outside group already had it prevalent in the population. However, to ensure that the group have the best chance of survival post-release we will worm the birds prior to release. In the meantime all staff could do was monitor the birds’ physical condition, try and minimise stress, and maintain hygiene standards. A couple of this year’s wild-hatched chicks continued to have respiratory issues this month due to Syngamus. It is a lot harder now to trap the free-living group inside the aviary. The older birds (i.e. with more experience) have learnt to become more vigilant around staff if they see them near the release hatches. We did manage to lure in one of the wild chicks and treat with ivomec. He was quite thin and a lower weight than expected for a healthy bird his age. He was released straight away and has shown great improvement since. The other chick, from a different clutch, is still at large. She is sneezing and struggles with breathing if stressed. Easy to identify at the aviary at least. We will continue to monitor her and attempt to treat her when possible. Wild chick (PP003) with parent back in July before she started showing signs of a Syngamus infection. Photo by Liz Corry. A potential opportunity to worm the individuals with clinical signs of Syngamus arose when we caught the 2016 captive-bred chicks to attach radio-transmitters for post-release monitoring. The group we released in July were not fitted with transmitters because the manufacturers were still processing the order. This meant we now had all 10 locked inside to fit and the two parent-reared Durrell chicks to lure in from outside. Sadly, the day the radio transmitters arrived in the post was the same day one of the parent-reared chicks went missing. Chick S has not been seen since 18th September. He is the only chough to go missing in that time which adds to the suspicion that he has met an untimely end rather than flown away from Sorel. His disappearance is a significant loss to the group as a male and as Durrell’s first parent-reared chick. One of Durrell’s parent-reared chicks is missing presumed dead after two months of being released into the wild. Photo by Bea Detnon. We still had another eleven birds to catch up and attach transmitters to so work began with the inside group. A radio-transmitter being fitted to the central tail feathers. 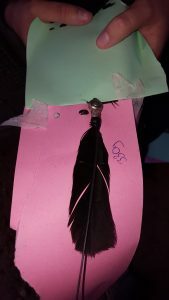 The cardboard is used to keep the other feathers away from the glue. Photo by Liz Corry. We teamed up with Durrell’s Vet Department to try and get as many birds as possible processed in one morning. With two people fitting the transmitters the entire group was done before lunchtime. Well we did start at 9am and had already given Chick X her gear a few days earlier. 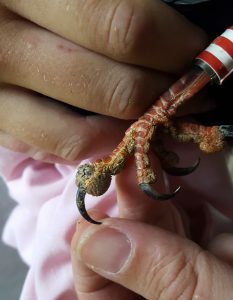 With the bird in the hand it also gave the Vet an opportunity to check it over pre-release and for leg rings to be adjusted accordingly. The newbies had arrived with striped rings to distinguish between individuals. Some of the colours had proven difficult to read in the aviary. 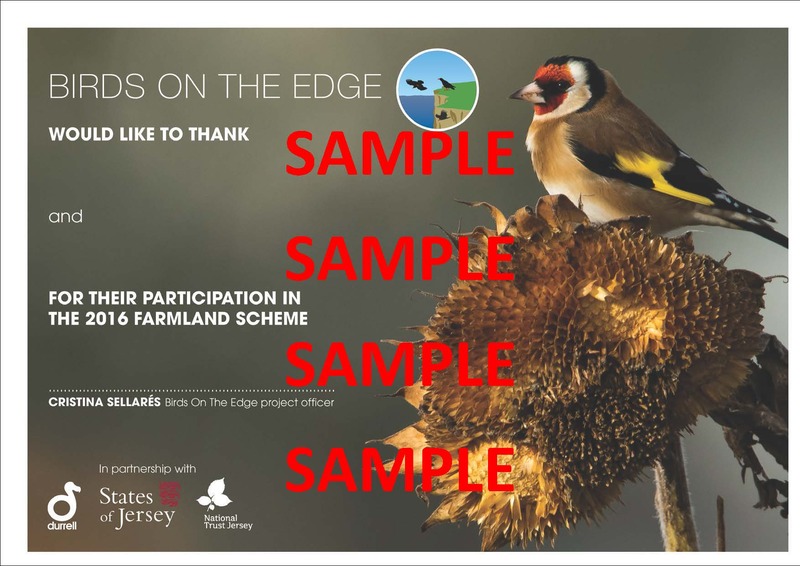 Once flying free it could only get worse so these were changed in-line with our ringing scheme. Of course the one really obvious ring (green and white striped) turned out to be the only one that had broken and needed replacing. 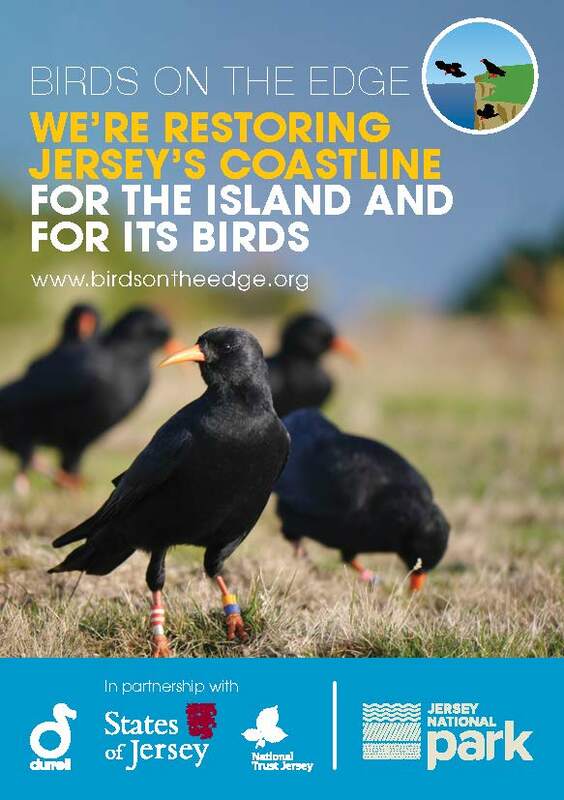 She now has the privilege of being the only Jersey chough with two red and white striped rings. 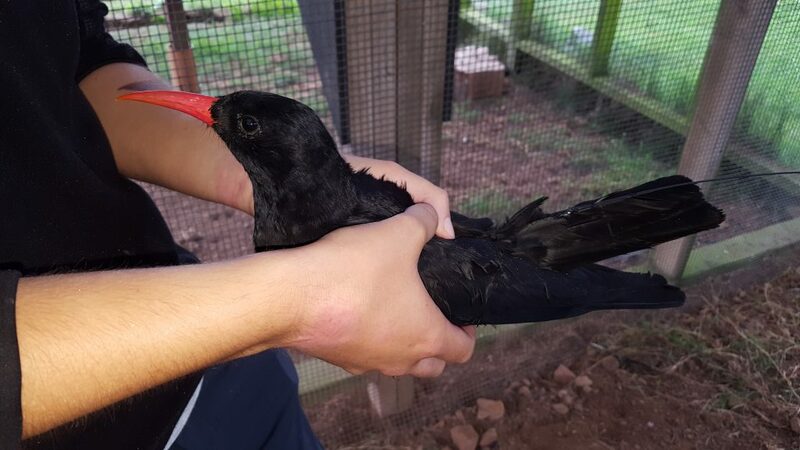 One of the Paradise Park choughs developed a swelling on one of their digits since moving into the release aviary. Photo by Liz Corry. 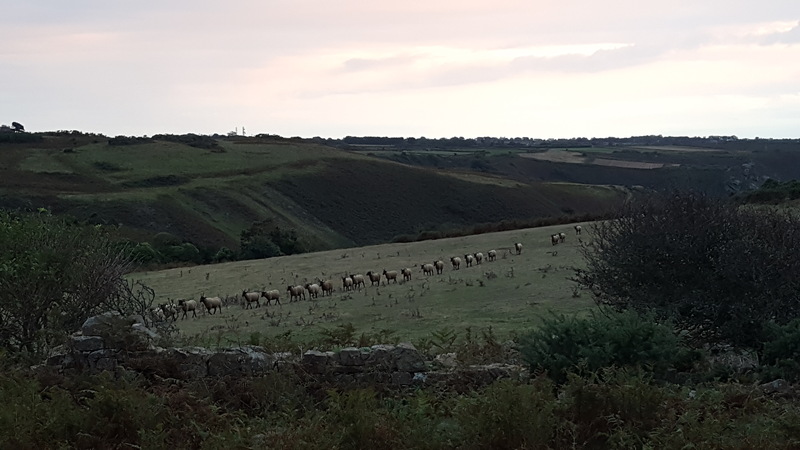 The Vet was happy with the condition of the birds taking into account the family of nematodes the choughs are harbouring at Sorel. One individual presented with a swollen toe-pad evoking scary thoughts of bumblefoot. The bird has not appeared to be in discomfort whilst being in the aviary or when we had her in the hand. We will continue to monitor this, but it terms of release she was given the all clear. 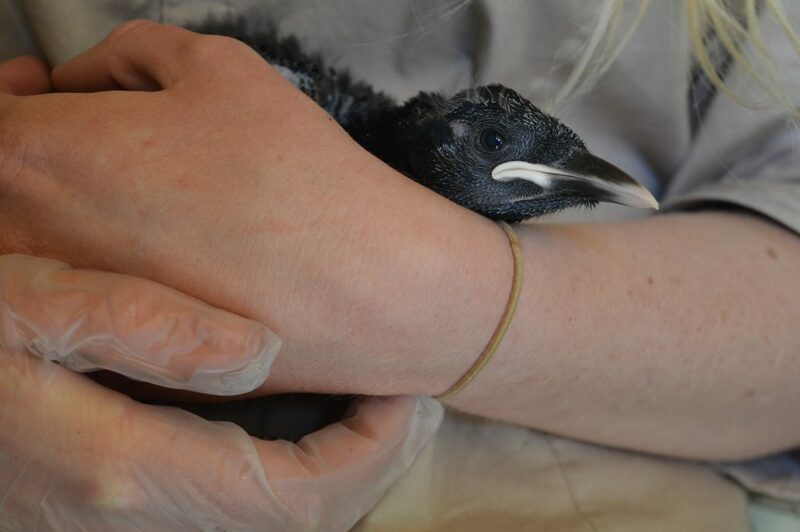 The last bird to be fitted with a transmitter was Chick T, the parent-reared Durrell chough living outside. With a bit of patience this was achieved a couple of days after the vet visit. We had managed to trap two other birds in at the same time and had hoped to change a faded plastic ring on one of them. However, the weather was not in our favour so use of hand-nets in the wind and misty rain restricted us to our primary objective. Chick T was very compliant and was fitted with a transmitter in record time. He has now been officially named Trevor. A nod to Trevor Smith who works on Durrell’s Site Services team. He helped build the aviary and continues to help when major repair work is needed. Chick T was the last of the 2016 captive-bred chicks to be fitted with a radio transmitter. Photo by Liz Corry. The only concern we had with Trevor (the chough that is) was the presence of stress lines in his central tail feathers. These occur as the feather is growing at times when, for various reasons, the nutrients required for growth were not assimilated correctly. It is often associated with caged birds living in poor conditions, but can also be when healthy birds have a change in diet. For Trevor it might be related to the move from the aviary at Durrell to the aviary at Sorel where the diet is slightly different and the bird has access to a wider variety of insects. 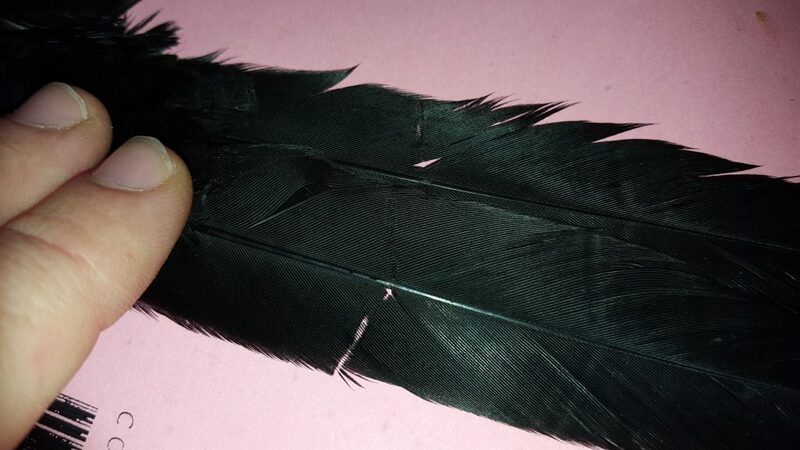 Stress bars in the central tail feathers of a captive-bred chough. Photo by Liz Corry. Trevor was released straight away to re-join the outside group who had been waiting around the aviary for the morning supplemental food. The free-living group have been getting on with life at Sorel relatively incident free. They appear to be finding more food in the wild, possibly related to the change in weather no longer desiccating insect larvae. There have been a few fights around the supplemental food bowls. With 25 birds and more to add soon, competition at feed times is to be expected. To address this we are looking to switch the ceramic dishes for specially designed chough troughs. The checkout assistant may have questioned why I needed six end caps for one length of guttering, but I left the DIY store content with my purchase and proceeded to make three new feeders. 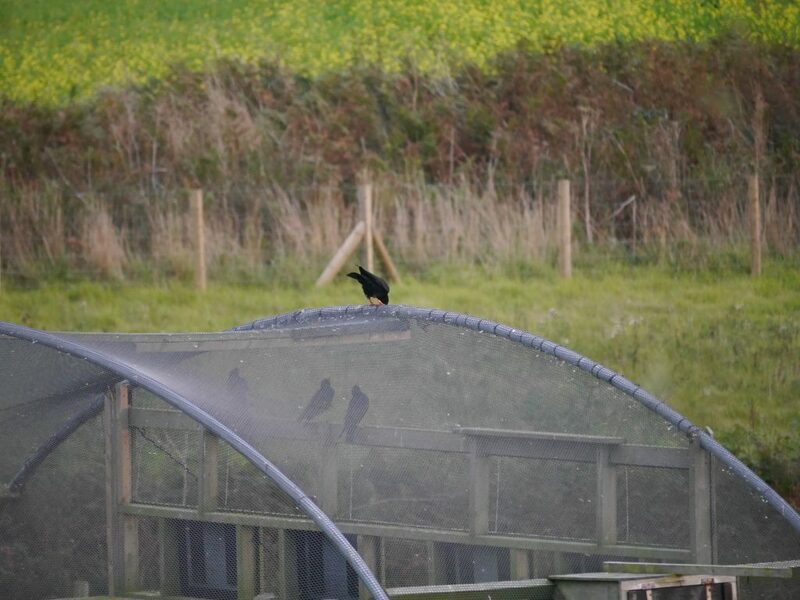 The choughs seem happy enough as now several birds can feed at the same time (or several feed whilst one walks down the middle). Newly installed ‘chough trough’ at Sorel to help reduce competition. Photo by Liz Corry. The group has been observed using the area around the dirt-bike track a lot more for feeding as well as trips over to Devil’s Hole. They may well be going beyond that as we are not surveying them continuously. We had a report of a bird with an unusual call around the grounds of a house at the top of Waterwork’s Valley. The owner suspected it was a chough, but had no visual sighting. I also received a report of a single chough flying over a house at Victoria Village in the early morning. Lee, Cauvette and Pyrrho have switched back to roosting at the aviary using the external roost boxes. Photo by Liz Corry. 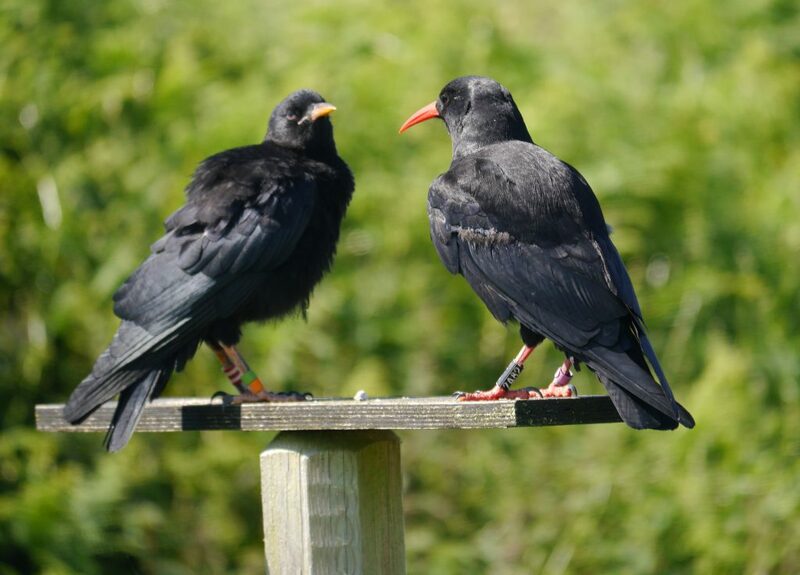 Whilst each report had an element of doubt to it we can’t deny that the choughs will do things to surprise you and throw your own knowledge into doubt. 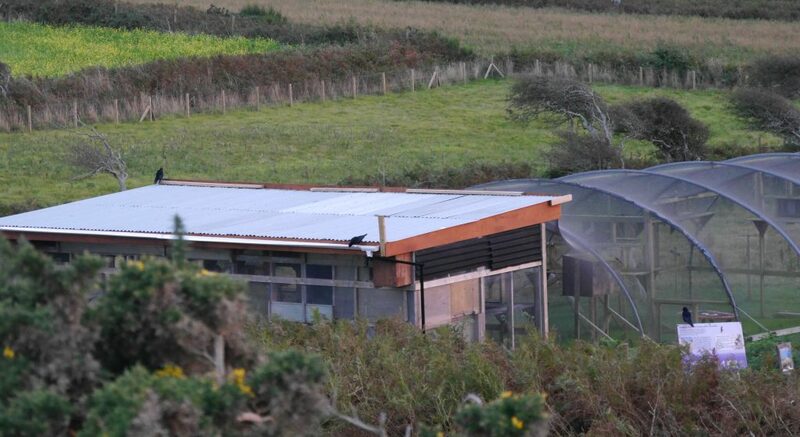 Roost checks towards the end of the month revealed that three of the older birds have ditched their roost site in the quarry in favour of the external boxes at the aviary. Lee and Caûvette followed closely by Pyrrho return to the aviary at sunset. There was a confused wild chick one evening who had become separated from the quarry group. After ‘discussions’ with the group locked inside he flew off towards the quarry calling all the way. A wild chick separated from his roost group shortly before sunset looked for alternative accommodation at the aviary, but was turned away. Photo by Liz Corry. The roost checks also revealed another interesting sight at Sorel…. If you look hard enough at the photo of the three older choughs returning to the aviary (Lee, Caûvette and Pyrrho above) and, to be fair, use a certain amount of imagination, you will see a kestrel perched in the hawthorn tree. There are several kestrels around Sorel and an ongoing love/hate relationship with the choughs. The aviary provides a useful vantage point for hunting and attracts a lot of rodents (i.e. food). 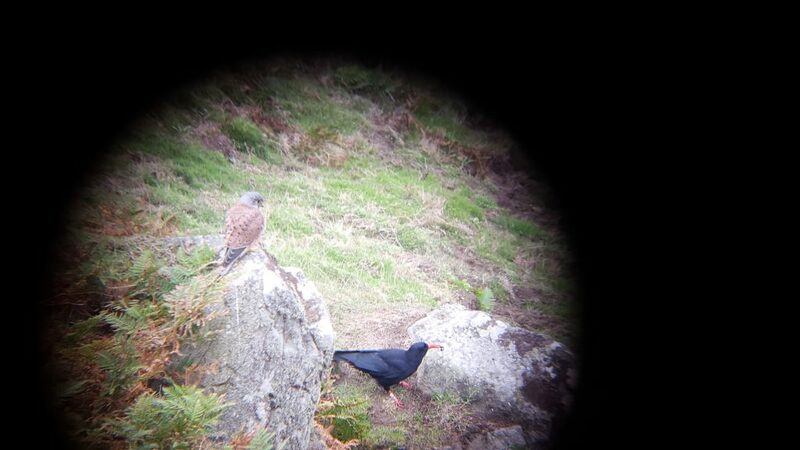 Of late the bond between chough and kestrel seems to have strengthened. This month they have been seen preening next to each other, sharing the same perch at the front of the aviary, and, more amusingly, flying together on the cliff face. Lee and a few other choughs were observed hanging out with a kestrel on the cliffs flying in unison from rock to rock. Photo by Liz Corry. We don’t know if it is the same kestrel each time, but there does appear to be one chough in particular who crops up in all the photos of these events; Lee. There is evidence of choughs associating with kestrels in other countries. Normally related to breeding territories and the benefit kestrels provide by deterring other bird of prey species which predate choughs. A lot more clinical and less anthropomorphic than our observations imply. The International Air show at the start of the month meant that once again the red-billed choughs ‘joined in’ with the Red Arrows display. Although this could only be appreciated from Sorel and photographic evidence is poor. A few of the planes used the north coast to turn around and re-group. Unlike last year the Red Arrows did not fly over the aviary much to the delight of the choughs locked inside. 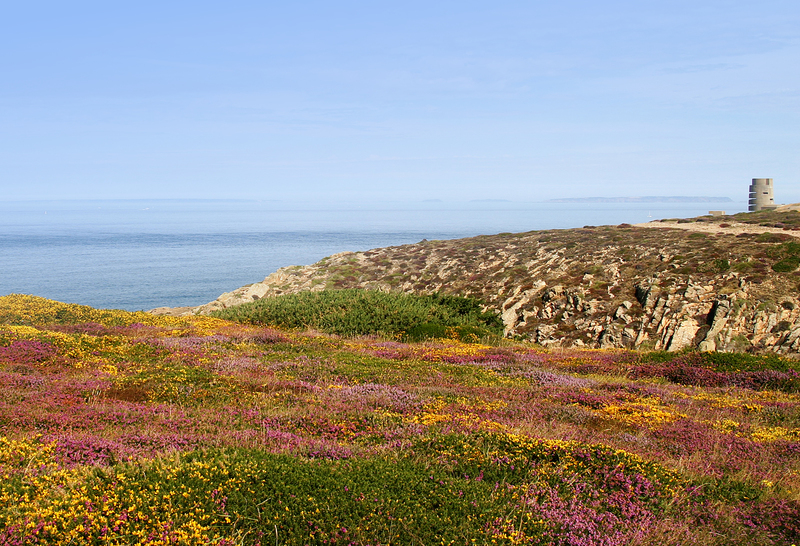 Those outside were making the most of the air currents along the cliff tops and put on an impressive display. 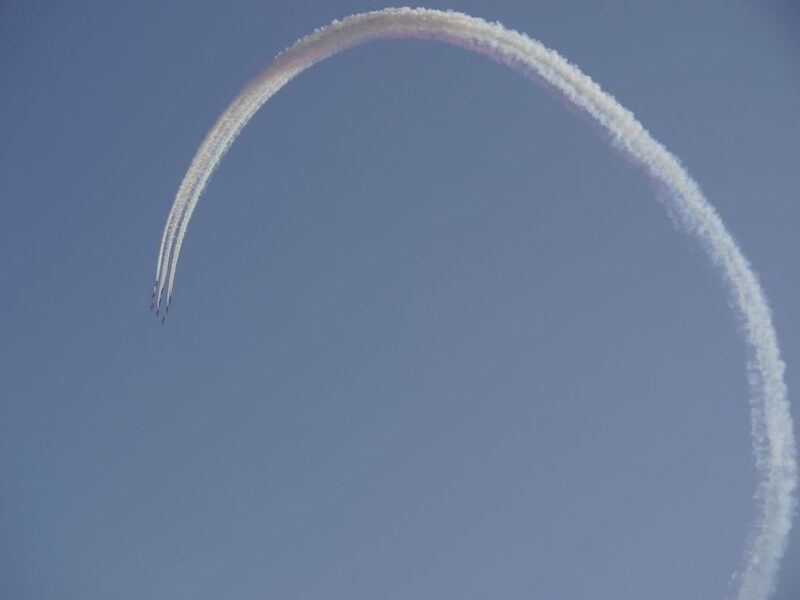 The Red Arrows in Jersey viewed from the release aviary at Sorel. Photo by Liz Corry. 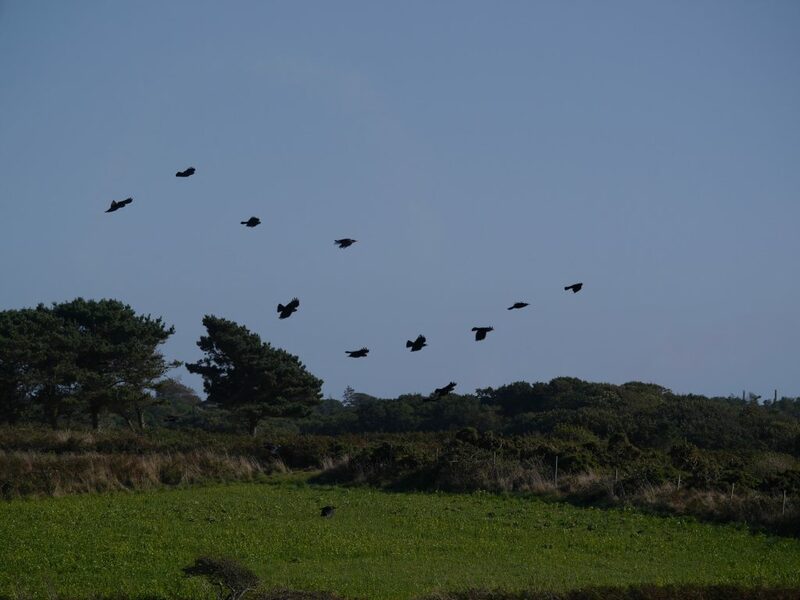 The Red-billed choughs flying in Jersey (Red Arrows just out of frame to the right). Photo by Liz Corry.